This months post is a compilation of project photos of various products we have done over the past months, some of them very unique and helping to serve our Law Enforcement. We hope you like what you see. This was a unique project that we built for the Erie County Tactical Team, allowing the team to have the Forceable Entry Hammer located on the back of the team member in front of them. Saving time when it counts. Complete team equipped. 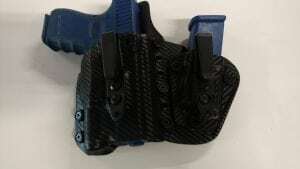 We built this holster when a customer wanted a mag and holster combo for appendix carry. Our unique design allows them to take the mag holder off and even wear it at the traditional 3:30 -4 o’clock. We also included our standard adjustable retention system. Looking for a different way to carry your EDC Knife? Let us build a custom sheath. This unique design is retention based eliminating the need for a strap to secure the knife in the sheath. In addition, it is designed to be worn horizontally instead of vertically making it easier to conceal under your shirt. Yes, we are finally rolling out our newest product: the double mag holder. The unique design uses our universal mag holders allowing you to accommodate 9 mm, 40 cal, and 45 caliber magazines ranging from single stack to staggered stack. Yes that is right one mag holder for all your handgun needs. Retail will be $39.95 plus shipping. Stay tuned for its release. We wanted to share a piece of our history. One of our customers had this civil war era military leather holster and belt and brought it in to show us. It even had the soldiers initials carved in it. This is a great reminder of how old our industry really is. If you have a custom project you would like us to build, or have something you don’t see on site but would love to see what it cost to make your vision become a reality, then please contact us at sales@justholsterit.com and let us try to meet your design needs.